Last year was our first time to have a booth at the Austin Maker Faire and it was a big hit. But oh, THE WORK. My husband and I, (which means mostly my husband) built a PVC catapult that the kids used to shoot paint balloons at a large canvas. Oh, the hours, the work, the mess. Luckily I had a dedicated staff of two continuously filling up paint balloons that got catapulted through the air as fast as they were being filled. We thought that we were so prepared, but you have no idea how many paint balloons can be launched in 15 hours. We actually have no idea either. I tried to figure it out, but it is really hard to say for sure. We had a constant line of people that eagerly awaited their chance to add their splash of color to the Wee Warhols canvas. 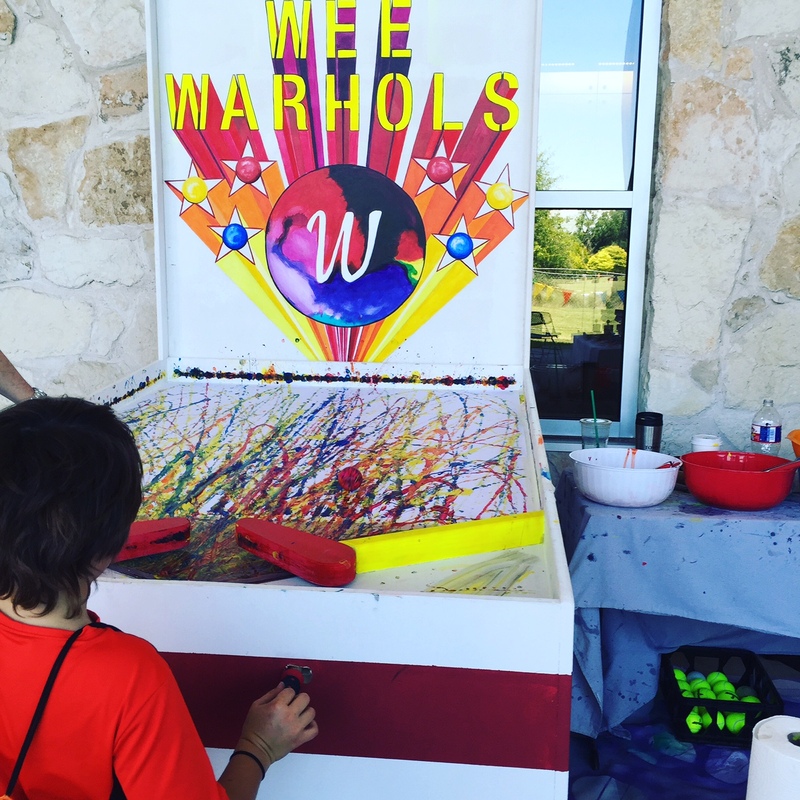 Due to the stress of the clean up process and lessons learned last year, Wee Warhols created a new interactive action art project to show at the 2016 Maker Faire. Inspired by Sam Van Doorn’s STYN Project, we built a LARGE pinball machine that people could make art with. 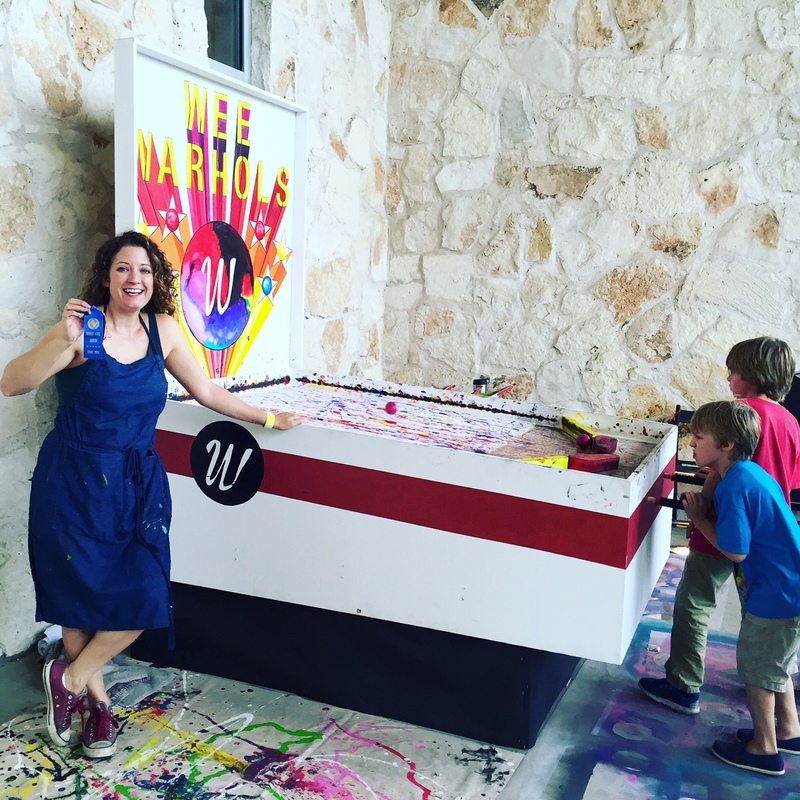 I dropped racquetballs dripped in paint on the large paper that we rolled out and the player–or sometimes two players–made the art by moving the flippers and watching the balls travel. The colors mixed and made beautiful markings. 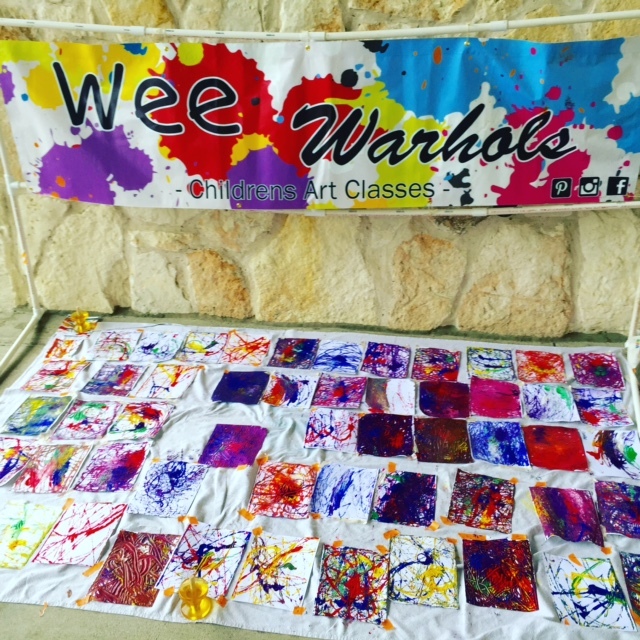 At Wee Warhols we love to do action art where the kids are creating, moving and having fun. This was a perfect example of that. We also had a table set up where the kids could do a small-scale marble rolling art activity and take the art home with them once it dried. Last year we had a lot of requests for directions on how to make a PVC catapult with a lacrosse stick. I would like to apologize to the people that I promised I would write it all out and send it to them. Maybe I will get around to it one day. As for the pinball machine, all I can say is that my husband is pretty amazing. You give him an engineering or building project and he just figures it out. I would just watch him stare at the wood, scratch his head, stare some more — a lot of staring and thinking. All I know is that this finished product includes springs and ball bearings on the under side, with pieces of wood that make the flippers move. We added bicycle handles for the grips, and I made it pretty. We made some cool bumpers for it, but decided not to use them since they would create holes in the paper. Maybe we will add them with super-strong magnets and attach a metal sheet underneath, and maybe we will add electrical components to it. Since we don’t have the space for such a fun toy, we are thinking of donating it to a school or children’s museum where kids can have fun with it. If you have suggestions for what we might do with it, please leave them in the comments section below. Be sure to check out a Maker Faire near you! *If you are interested in building your own pinball paint machine, here are some building notes that my husband jotted down. I hope this helps to get you started. Backdrop is a sheet of 49′ x 77″ MDF attached to the back of the upper unit, with the top 49” x 50” remaining exposed, and then framed on top and sides by 1” x 4” pine. plywood for strength at the core and used balsa wood to cut down on weight. We cut out the rough shape with a bandsaw and finished with a belt sander. Painted with primer and glossy paint. 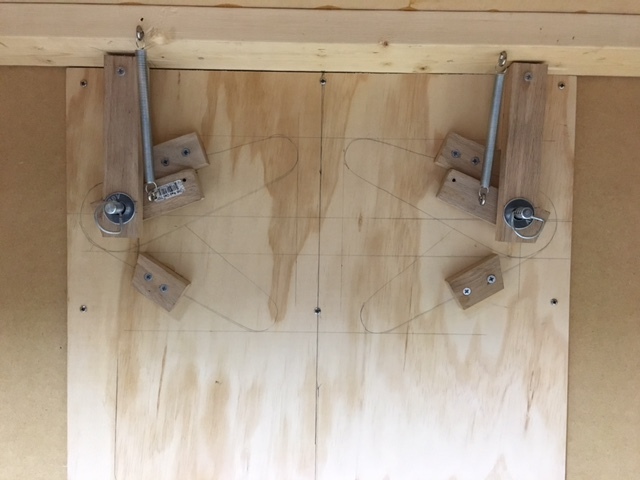 We built out the two flipper mechanisms using a combination of 3/4” dowel rods, pieces of 1” x 4” white oak (for rigidity and strength), 1/2” dia. clevis pins, washers, ball bearings, screw eyes and springs. Each flipper uses two sets of ball bearings nested in the platform, and a 3/4” dowel at the fulcrum. Attached to the dowel, opposite the flipper and below the platform is a 1” x 2” oak coupling rod of sorts, which runs parallel to the flipper. The push rod acts as a lever which is connected to a the oak coupling rod via a fixed clevis pin. Each dowel joint was reinforced with a smaller, additional dowel running through it perpendicularly. Spark Learning (a therapy center for kids with Autism and related disorders) would love to have the pinball machine! So fun!